Great opportunity to buy Two Carvel® Ice Cream franchises in great locations! These two well-established Carvel® franchise businesses have been in business for approximately 35 years and have built up a good loyal clientele and repeat business. Both these stores have a further 10 years on their lease. They are well located with the first store in Wayne, NJ close to 3 High schools and in a Shopping Mall with Walgreens. Second store is in Lincoln Park Shopping Mall with a Large Ace Hardware store. 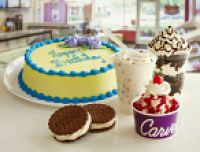 To find out more about these exciting Carvel® franchises for sale, please fill in our request information form.